Last week, the University of the Pacific in Stockton, California had a high-tech guest rolling around– and it was stocked with snacks and beverages. 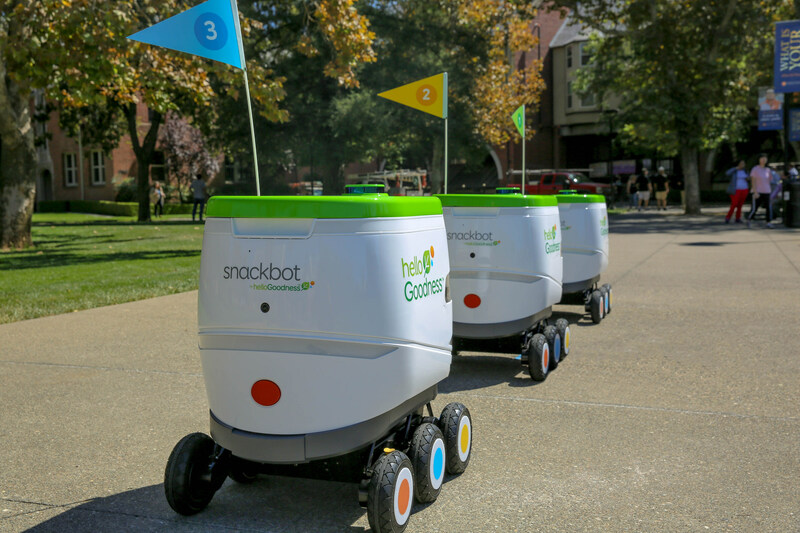 The snackbot is an outdoor, self-driving robot bringing enticing snacks and beverages from Hello Goodness, a curated portfolio of better-for-you brands from PepsiCo, to hungry college students. As part of a collaborative partnership with Bay Area-based Robby Technologies, the Hello Goodness fleet of snackbots are the first robots from a major food and beverage company in the United States to roll out, bringing great-tasting, healthier snacks and beverages direct to students, making better-for-you snacking ultra-convenient. As today’s college students are seeking on-the-go sustenance and nourishment amid packed schedules, they’re turning to snacks more often as three fixed meals become less common on campus. The Hello Goodness snackbots are a user-friendly and fun solution for this on-demand snacking mentality and are stocked with choices everyone can enjoy, including Smartfood Delight, Baked Lay’s, SunChips, Pure Leaf Tea, bubly, LIFEWTR and Starbucks Cold Brew. Building on the initial successes of its Hello Goodness vending platform, PepsiCo has expanded the idea of curated convenience into new formats, locations and experiences to deliver 50,000 touchpoints by the end of the year. The snackbot is part of this effort, catering 24/7 healthier solutions to fuel the always-on consumer. The bots are ready to roll with a range of more than 20 miles on a single charge and are equipped with camera and headlights that allow it to see and navigate carefully in full darkness or rain, as well as all-wheel-drive capabilities for handling curbs and steep hills.